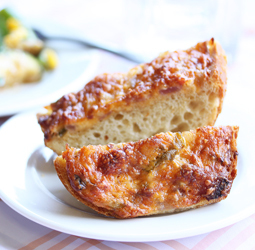 You’ve read my post about the Wisconsin Farmhouse Gooey Cheddar Bread, so this is the follow-up post about the Patriotic Family Picnic menu from the cooking class at Grace-Marie’s Kitchen at Bristol Farms in Manhattan Beach. Grace-Marie chose recipes from the four corners of our country, so we not only had the pleasure of Wisconsin Gooey Cheddar Bread, but also California Coast Grilled Vege Picnic Salad, Alabama Back Roads BBQ Chicken and Maine Countryside Blueberries and Lemon Cream Bars. It was so much fun to watch Grace-Marie grill the ingredients for these homey dishes, creating the wonderful smoky, charred flavors. These recipes are perfect for a picnic or BBQ, and now that I’m looking at the photos, I’d like some more of this food as soon as possible! 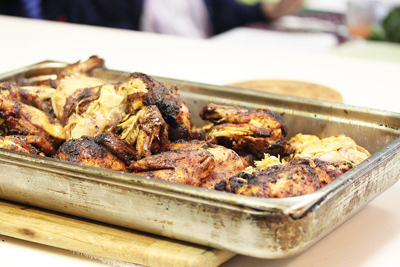 Grace-Marie started off with the Alabama Back Roads BBQ Chicken recipe. 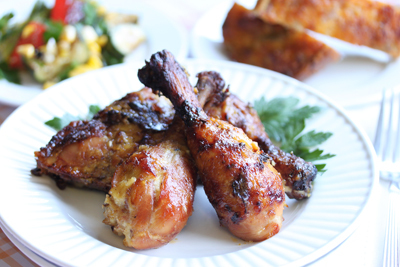 She had coated the chicken with oil and a seasoning rub, and refrigerated it over night. 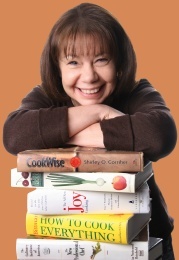 She browned them on indoor grill pans on the stove and finished them in the oven. Grace-Marie explained that she likes seasoning rubs to flavor the meat, because marinades break down the meat fibers, making them mushy (ugh), and rubs don’t. Next the white BBQ sauce was ladled over the chicken and returned to the oven. This sauce has a mayonnaise base with cider vinegar, honey, horseradish, garlic and Dijon. Really delicious. 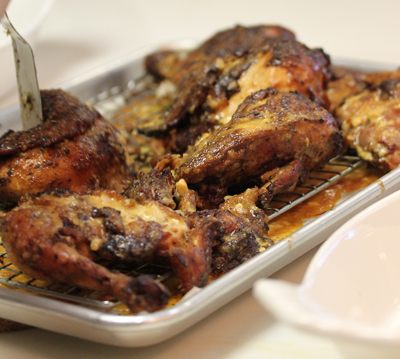 When the chicken came out of the oven, it had such a beautiful caramelized color and flavor to match. 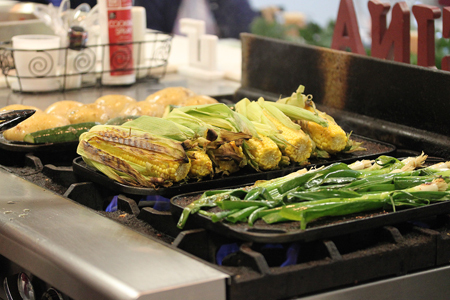 While the chicken was roasting, the vegetables were being grilled. They had been tossed with olive oil, minced shallots and Italian herb seasoning. Is there any better way to prepare veggies? They get charred and caramelized with those great grill marks. The veggies were cut into bite-sized pieces and tossed with roughly chopped Italian parsley and a red wine vinaigrette. This was such beautiful food! 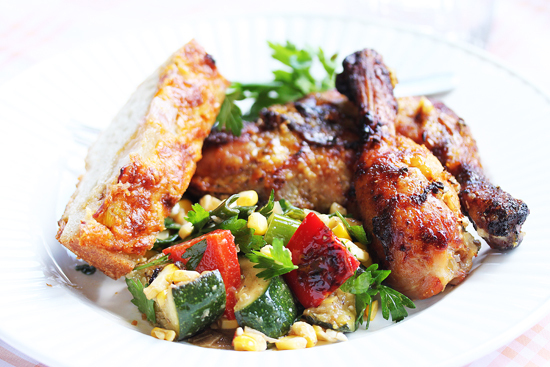 The BBQ’d chicken, roasted vege salad and the cheese bread. 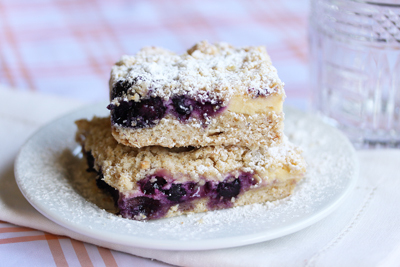 And then, when I was feeling like I had died and gone to heaven, along came the dessert, Maine Countryside Blueberries and Lemon Cream Bars. The perfect end to a fabulous luncheon. Grace-Marie, you are a genius! 1. Whisk the sauce ingredients together in a bowl and reserve. 1. In a bowl, combine and mix the seasoning rub ingredients. 1. Coat all sides of the chicken with the oil and seasoning rub. Refrigerate overnight. 2. Prepare and warm an outdoor or indoor grill to medium heat. 3. Arrange the chicken, skin side down, onto the grill over partially indirect heat. Grill, uncovered, until the first side begins to brown (10 minutes), then turn and brown the other side (10 minutes). 4. Once browned all over, continue to grill, brushing with the sauce and turning several times until glazed well and cooked throughout (165 degrees F internal temperature in the thickest portion). 5. Note: Once glazed and charred the chicken can be placed into a large roasting pan and finish cooking in a 400 degree F oven. (To 165 F in the thickest portion). 1. Arrange the chicken onto serving platters and garnish with the onions just before serving. 1. Prepare and warm an outdoor or indoor grill to medium heat. 2. Warm the oil, shallots, dried herbs, salt, pepper and crushed red peppers in a saucepan over medium heat. Simmer (5 minutes) than cool to room temperature in the pan. 3. Brush the corn with the mixture, wrap the husks back around the cob and grill (uncovered), turning occasionally, until the corn is tender and the outside is charred (15 minutes). Or roast in a 400 degree oven for 30 minutes. 4. Toss the zucchini, peppers, potatoes and onions with the remaining oil mixture. Grill until the vegetables are crisp tender (10 minutes). 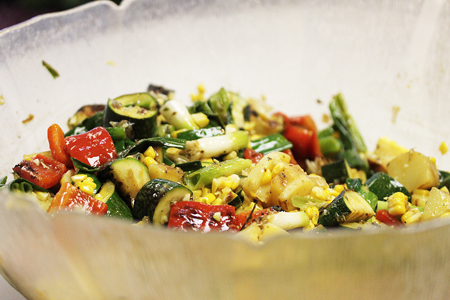 Transfer the grilled vegetables to a parchment lined baking sheet and cool to room temperature. Cut the kernels from the cobs and cut the remaining vegetables into large dice. Combine everything in a bowl with the parsley. 1. Combine and process the oil, vinegar, mustard, honey, paprika, salt and pepper in a blender. 1. Just before serving, toss the vegetables with the vinaigrette, place in serving bowl and sprinkle with cheese, if using. What a beautiful salad! I loved seeing all those fresh colors mingling in one bowl. I am sure this tasted perfect with your chicken. The chicken looks amazing. I bet it was so tender and juicy. I love white sauce! AMAZING photos! I’ve still never tried white BBQ sauce. I should try this out. I can’t believe that wasn’t grilled on a real grill! Looks so…grilled! 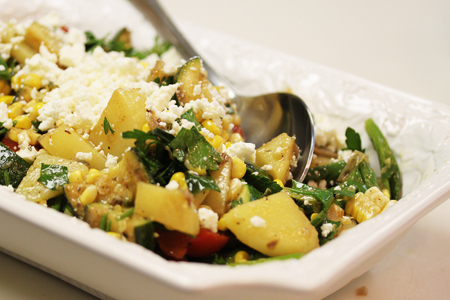 I’m especially enamored with the veggie salad since I’ve never seen that combo of corn and potatoes. 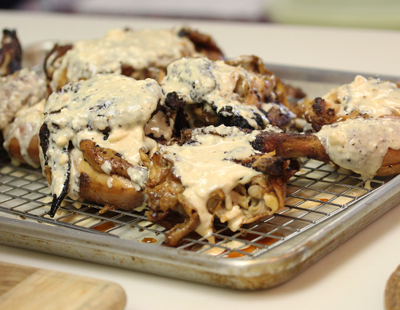 I tried the chicken and while hesitant about the white sauce found the flavors exceptional. 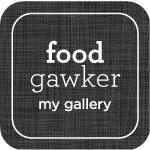 The next time I make this, I hope to achieve the texture of the chicken you imaged as it looks perfect! I did a second take of this chicken and repeated the fabulous flavors, confirming that white BBQ sauce isn’t freakery but something to be desired. While I haven’t achieved what I imagine to be perfect textured skin based on your images, I will try, try again! Thanks again for posting this recipe! 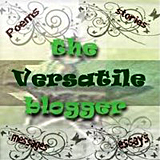 Next post: What Should I Post About Next?